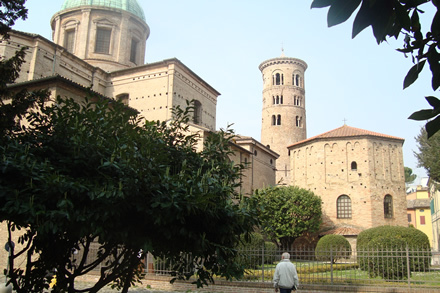 Back to Greece: This year not by Padova and Venice, but by Ravenna and Ancona. 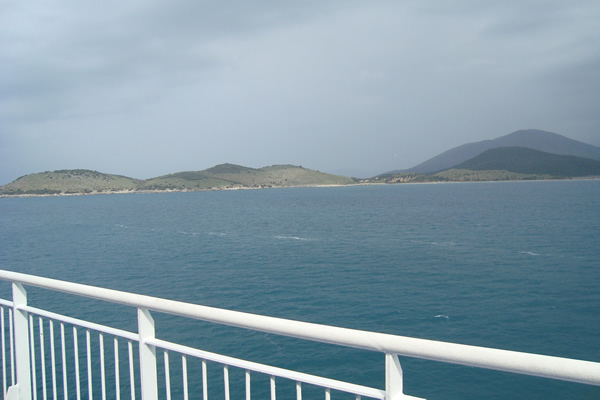 For the estimated time of arrival at Igoumenitsa we prefer to take the ferry from Ancona. 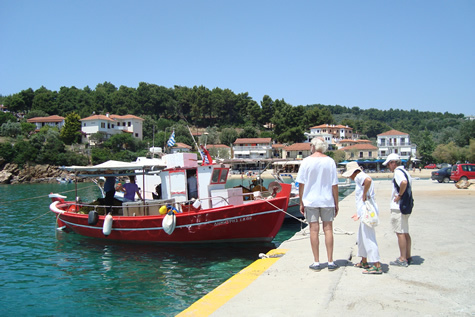 According to the winter schedule, - until the beginning of may -, the Anek-ferry from Venice reaches Igoumenitsa in the late afternoon. 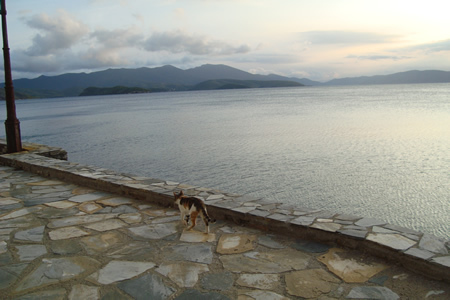 Taking into account the probable delay, we should have to spend the night in Igoumenitsa. In itself this would not be a disaster... if we not had to leave our heavily loaded car on an unguarded parking place. A hotel with private car park we yet didn't find in Igoumenitsa! Two years ago we could use a private parking, but this solution is not guaranteed. So, we decide to leave from Ancona, 170 km more South. 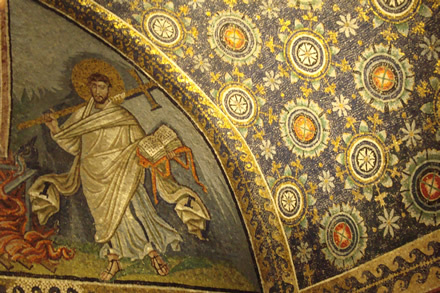 So this year no stop in Padova, with its charming piazze, its picturesque little streets, its imposing churches, its palazzi, its nice restaurants, but a stop in Ravenna famous for its splendid mosaics. We booked three nights in 'Hotel Astoria which has a private car park and is located at about ten minutes from the old town. The historic town centre is not very extended; this makes it possible to see the most beautiful mosaics and monuments and the most remarkable spots in two days without hurrying, walking from the one to the other and having the ample opportunity to enjoy the show and the atmosphere at the numerous squares and mainly at the Piazza del Popolo. 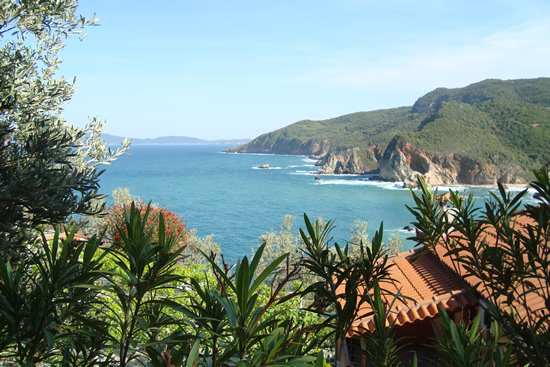 Sipping a cappuccino at the terrace of a trattoria or a caffè, under a bright spring sun is undoubtedly one of the charms of our - too short - stays in Italy, while the road to the Aegean Sea is still long. 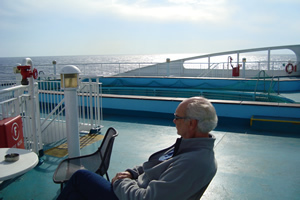 When a few days later we take the motorway towards Ancona, the grey sky is the herald of the windy and rainy crossing to Greece on board of the comfortable Fastferry XII that we have booked online by the website of Anek Lines (co-operation Anek Lines & FastFerries ). 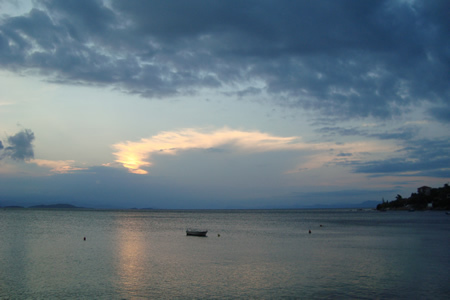 The Fastferry XII is approaching Igoumenitsa, threatening skies, picture taken from starboard looking to the coast of Epirus. The Egnatia motorway is - except a few trucks and three or four cars - deserted, as during our previous passages. Shortly after the exit of Metsovon, the E92, still very narrow and tortuous, is even more deteriorated. The fog makes the descent towards Kalambaka not nicer. We continue towards Trikala and Larissa where the E92 joins the Thessaloniki-Athens motorway. 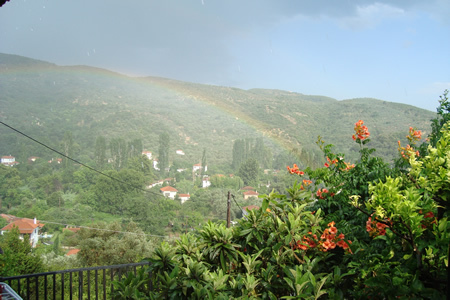 After the Velestino-exit to Volos it starts raining. Volos offers on this late Monday afternoon the sad face of a city hit by the crisis - the closure of shops contributing widely. When two hours later some blocks in the fireplace spread their nice heat and we are overlooking the tall green grass and the coloured spring flowers, we hope for a mild early spring. Vain hope, because this year we'll have to wait until the end of April before we can forget the heating: the still abundant snow on the mountain peaks and the very cold, windy and wet weather seem to leave the free field to the winter of 2014-2015 to still dominate this part of the Mediterranean. When the lilies will not flower anymore, will then the temperature at last be milder? 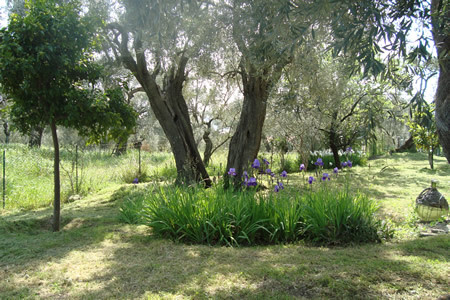 A fickle, uncertain spring; the weather mirrors the Greek drama .. 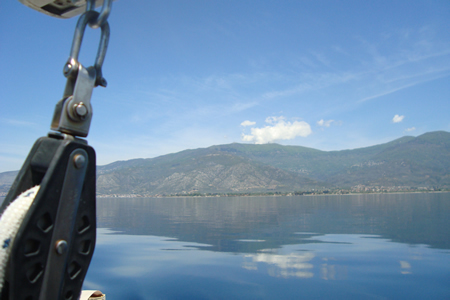 Behind us, Volos and the mount Pilion. 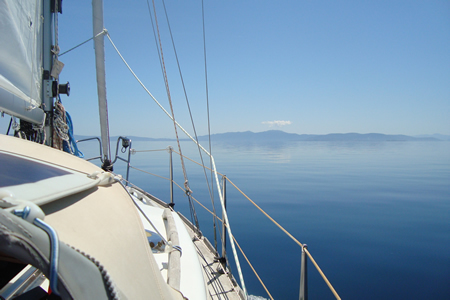 On a flat calm sea, we motor to the South of the Trikeri peninsula. Just after noon the wind rises. 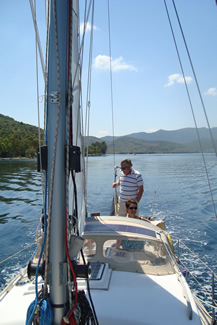 We stop the engine and tacking we head to Horto. Nicole and Raymond are for a week on visit. The forecasted rainy and windy weather makes place - one day rain excepted - for pleasant and nice spring weather with afternoon temperatures around 23 to 27 degrees. As nights are still fresh we usually prefer having dinner inside instead on the restaurant terraces. 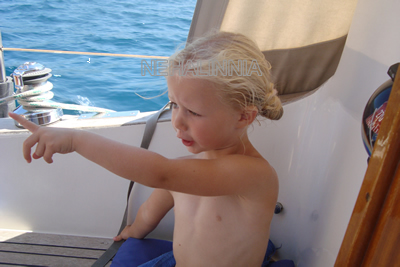 We also show Nicole and Raymond the beautiful spots at the East coast of the South Pilion. 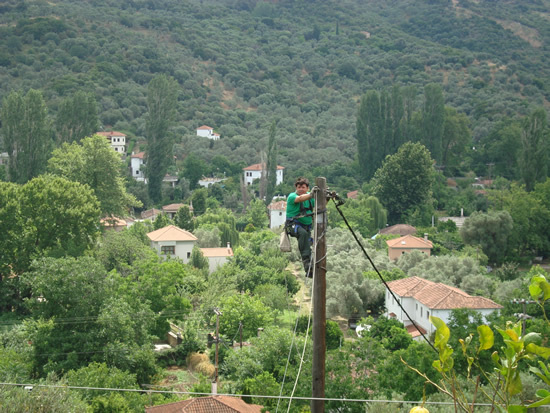 The electricity company provides some unusual spectacle. In order to improve the power supply - during this unusual cold spring not a luxury - not only the meter and the main fuse must be replaced. Also the old, thin, and the by the weather-plagued cable has to be renewed. 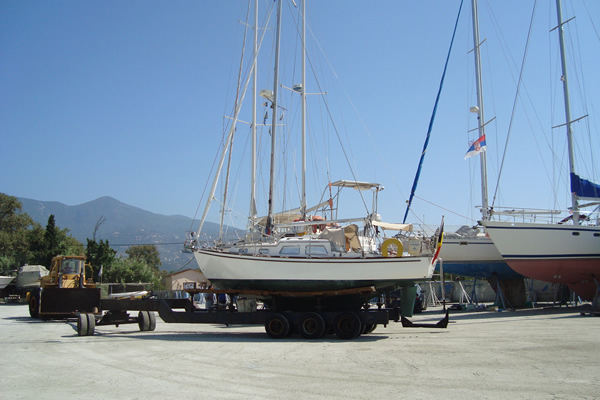 Rinaldo and Maryse, our friends from Menton (F) , arrive with their 14 m long Amel from Leros via the Sporades on visit. 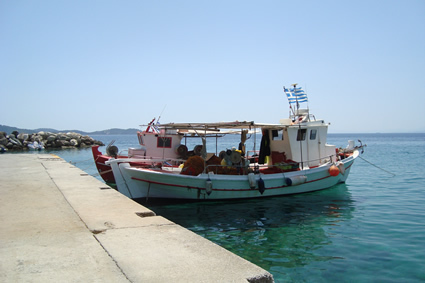 In Ormos Vathoudi they can safely leave their boat. We visit Platania, drive to Katigiorgis where in a taverna where we were many times since 2009, we get dished up a wide variety of tasty mezés. In the little more northern Paltzi we have a coffee. It's here barely less deserted than at the beginning of May when we came with Nicole and Raymond: we count 12 visitors and 4 umbrellas! The collapse of the Greek tourism and the apparent decrease of foreign visitors now the crisis more and more threatens to evolve into the actual default of the country paving the way for leaving the currency Union, is becoming day by day more evident. This spring ends like it started: with dark clouds over a beautiful country. When we arrived a dense fog was covering the region. The winter seemed not really intend to leave. Although we have counted many nice days in April and May the temperature was lower than normal, June also was characterized by relatively unstable weather although the average temperature fluctuated between 25 and 30 degrees, with some outliers to 36 degrees. 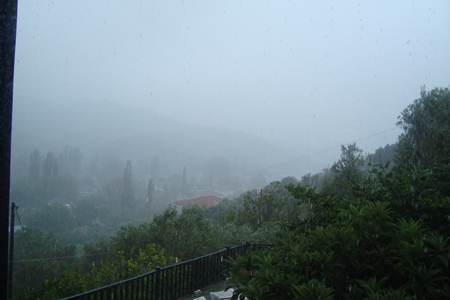 It seemed that the weather wants to illustrate the ongoing negotiations between the on January 25 elected left-wing Government and the lenders of Greece. Moments of hope were followed by disillusions which again were followed by optimism quite immediately turned into pessimism again. And as the summer was approaching temperature began to rise. Today less than 10 days before the due date for the repayment of the bundled EUR 1.6 billion June IMF debt and one day before for what passes for the meetings of the last chance - first, with the so-called Eurogroup, thereafter, with an Euro Summit ( meeting of heads of state or government of the Eurozone countries ) - nobody seems to be able to foretell a likely outcome. Will the dark clouds be pushed away by reasonableness, or will win absurdity and unreasonableness and will the horizon above the mountains become completely dark? 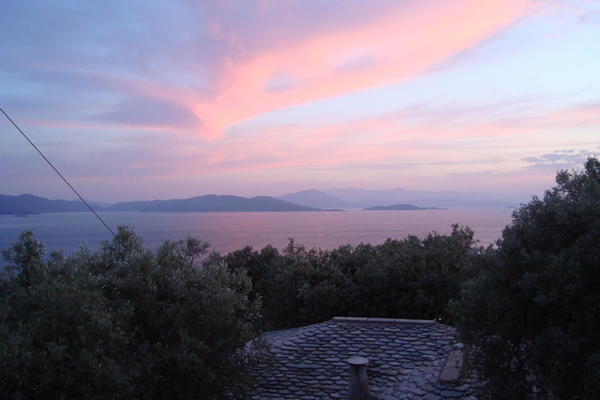 For all our friends and acquaintances, and for all those friends and acquaintances of our friends and acquaintances, for all ordinary Greeks, in anyway definitely more victim than guilty for the ruination and decay of this country, we hope that the horizon will clear out. The real culprits go unpunished anyway .For that power is taking care . A few months later, we look back on this exciting period. We have experienced the successive crisis moments with varying feelings analyses and conclusions. From sympathy for the courage of Prime Minister Alexis Tsipras evolved to annoyance and big doubts for the Greek positions in our opinion many times the result of improvisations. But also with admiration, then again with disapproval, with doubt or again with understanding we followed the tactical turns - or what appeared to be as such. - on June 27 the Finance Ministers of the Eurogroup postulate that Greece had unilaterally closed the discussions and by this way had made an end to the 2nd bailout. - on which Prime Minister Alexis announced in full tourist period, on Sunday evening, June 28, the closure of the banks until July 6, a capital control, and withdrawl limit to 60 euro per person per day ( this limitation did not apply to foreign bank cards; update 11/15: 420 euro pp/week ). - on July 5 the referendum goes on; the Greeks reject massively the proposal, called by the Government to do this: No 61.31% Yes 38.69% blanks and invalid 5.80%, turnout 62.50% (9 858 508 registered voters) source: Min.Int. -on Monday morning July 6, when we go for shopping in Argalasti we notice some panicky reactions: a long queue at the unique ATM, unusually many cars queuing at the service station in the centre of the village; because we have to go tomorrow to Thessaloniki airport a 600 km round trip, we decide to take some precautions and fill two big jerry cans. - on July 9, the Greek Government asks the resumption of negotiations by the way of a proposal containing for the main part the by the referendum largely rejected European measures ! - on July 13, finally an agreement is reached after an overnight ( 12-13 July ) Euro-Summit ( meeting of heads of state or government of the Eurozone countries ) followed by a EU-Council ( the heads of state or government of the 28 EU member states, the European Council President and the President of the European Commission ).. The guidelines of the agreement by which Greece gets a loan from 86 billion in exchange for a drastic program of reforms and privatizations ( that the on July 26 rejected and the on July 9 - mainly same - by the Greeks themselves proposed measures exceeds ! ) are passed a few days later under strong European pressure in the Greek Parliament with the support of the main opposition parties; the SYRIZA-Independent Greeks ANEL majority comes battered of the fight. - the so-called. Basic Agreement of 13 July is further clarified and formally approved by the Finance Ministers of the Euro Group . The European stability mechanism is involved in the development; the IMF holds its participation under consideration depending of the perspectives of a debt reduction. - on August 20 Alexis Tsipras announces the resignation of his government: it appears that first 25 in subsequent votes 43 of the 149 SYRIZA-MP are no longer following the Government, among them the flamboyant former finance minister Yánis Varoufákis and president of parliament Zoé Konstantopoulou. About thirty of them are following former Minister Panayiótis Lafazánis creating the new extreme left party Popular Unity. Parliamentary elections. After the resignation of the SYRIZA-ANEL government, the country goes to a third vote in only 9 months. The campaign is pretty flat. After five years of crises and very heavy, dramatic austerity the Greeks seem worn down if not immune to politics, undergoing with a kind of fatalistic awareness what Europe imposes. Because there is one thing - in large majority - they fear and want absolutely avoid: that Greece had to leave the euro zone. The polls are showing close results between Syriza and ND ( New Democracy ) and it seems that , this time, Alexis Tsipras gambled wrong in its hope winning again his parliamentary majority. But on the evening of September 20 it appears that the popularity of Alexis Tsipras - possibly also due to the lack of another hero and by the contempt and the rejection of so many Greeks for the old political class - and his tactical capacities ( although these are frequently vilified by many in Europe ) once more were underestimated. 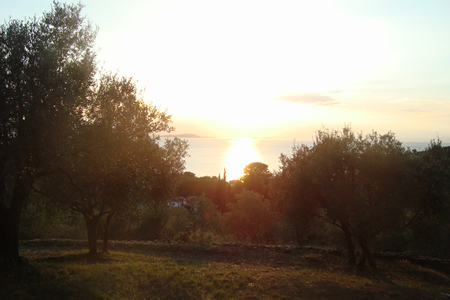 Is it now all peace and light in Hellas? With an unemployment rate around 25% - around 50% youth unemployment - , with the economic perspective (European Commission) of at least one year recession ( 1.4% in 2015, 1.3% in 2016 ), and the return to positive growth ( 2.7% ) in 2017 at the earliest, with the heavy reform- and austerity programme whose implementation will provide a lot of complicate and difficult discussions, while in the later autumn discussions on debt restructuring and / or debt relief-cancellation (would) have to start, still hard times are waiting for Alexis Tsipras, and not least by the developments in the refugee crisis. Airport. We have picked up Olivier, Helen and little Lena at the airport of Thessaloniki - International Airport Makedonia - as Ryanair now no longer serves Volos from Charleroi. It takes us almost four hours. On the return to Horto - it's close to 9.30 pm by the exit to Paralia Katerinis - we propose to look for a taverna in Paralia . It is very busy: the seaside resort on this part of the Aegean Sea with flat sandy beaches, is an very popular spot for Eastern Europeans: seems like we now suddenly are strolling in Bulgaria or Serbia! Little Lena is fascinated by the spectacle of traditional dances on the square. 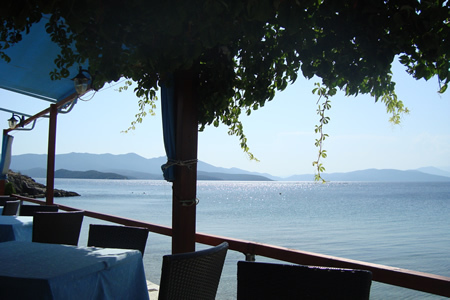 Eventually we choose Kapetanios taverna ouzeri. We pay only 35 euros for six dishes what is significantly cheaper than in the Pilion! After dinner we have still a more than two and a half hour drive to do. The A1/E75 Athens-Evzoni (Macedonian border) motorway - which should make possible a fast connection mainly between Athens and Thessaloniki and thus should come in place of the old 2 x 1 lane (!) National Road - is after more than twenty years still not entirely finished. 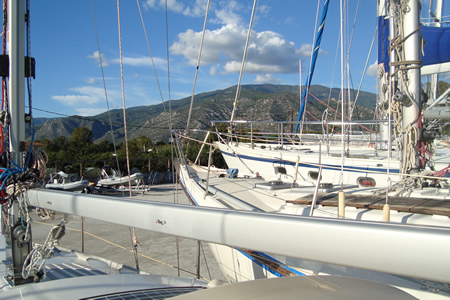 Despite the whole return trip costs nearly 25 euros, especially during the transit of the mountainous part at the Tempi valley between Nei Pori (N) and Evangelismos (S) where we pass the site of the Aphrodite Springs drive is slow as we are here stuck by the in the night increasing freight traffic. The lack of a well developed, modern and fast network of roads, and ( complete ! ) motorways, is considered by many analysts as one of the major structural handicaps in relation of the weak development of the Greek economy and, in particular, od the establishment of well functioning SMEs. 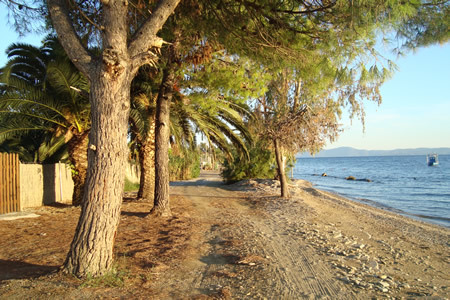 Although Horto - nor Milina - have no large nice sandy beaches as we had on Lefkas, or more recently in Paltsi on the East coast of the Magnesia peninsula, Lena is finding her liking on the small beach at the pier, on the so white pebble beach down the Leda hotel or by the swimming pool of this resort. 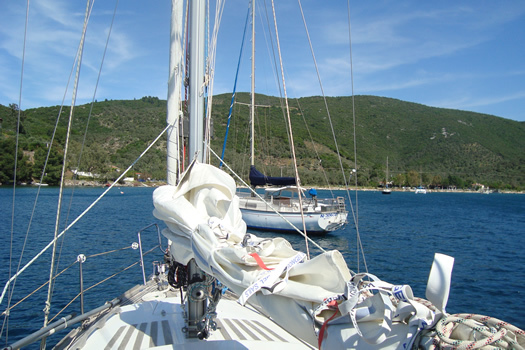 Usually the wind is rising just after noon: then it's time for sailing. We do not follow a strict course as the katabatic wind is to capricious and changing therefore. 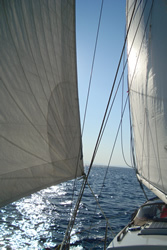 Mostly, in the middle of the gulf there is less or no wind at all. So, we often try to find the wind along the coast. 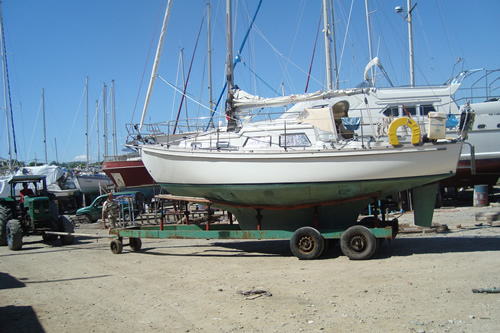 On July 10th our former pontoon neighbours of VVW Nieuwpoort, Liesbeth and Leo, left for a long trip with their She 36. They keep more precise information about their purpose. 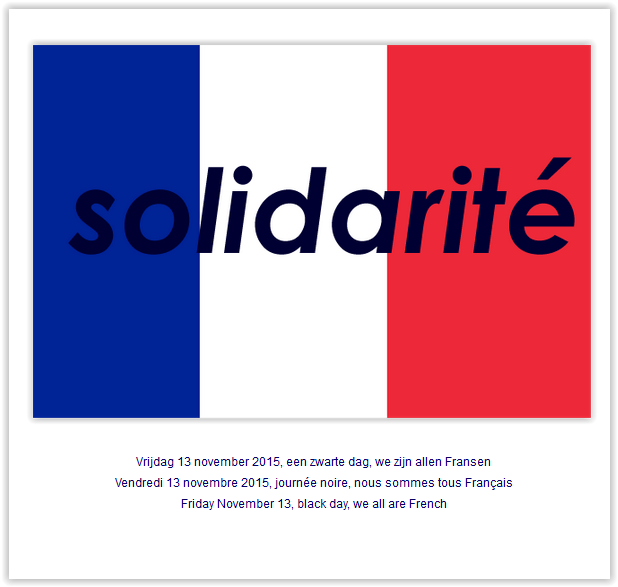 Via their website http://www.shetwins.com ( only in Dutch ) we will follow them with great interest! We wish them a safe cruising. Also this year the meltemi ( from Turkish meltem)is entirely absent. This etesian wind is a northerly wind ( high pressure on the Balkans, low on Turkey ) blowing in the Aegean Sea with a lot of similarities with the mistral. In the summer this wind blows mainly from the NW to the NNE, starting from the midday to the evening, but this wind can also reach force 7 to 8 during many days. So, this summer, no meltemi, but a lot of southerly wind. While april and may were very fresh, june was still unstable ( we count 15 days with at least half a day cloudy/overcast or very cloudy, of which 6 days with at least half a day rain). July and August ( especially the second part ) were quite hot (afternoon temp. shadow 30-35°C) and the humidity was often quite high. During the first week of september too, the afternoon temperature is above 30 degrees: on Saturday 5 and Sunday 6 we noticed 34 and 36°C, little or no wind ... before a sudden cooling and the first precipitation since nearly two months, a real present for the thirsty nature! Although we notice in September about 20 very nice days with plenty of sunshine and afternoon temperatures above 25 degree C autumn is coming: on September 21, the beginning of the meteorological autumn, we get a heavy and long thunderstorm, and, three days of rain. Thereafter the weather restores: it is mostly sunny with some light clouds, apart from some unsettled days sometimes with thunder. But in cauda venenum - the poison is in the tail: from October 15 we get usually cool weather, afternoon temperature 15 degree C while days without cloud cover and without precipitation are rather scarce. 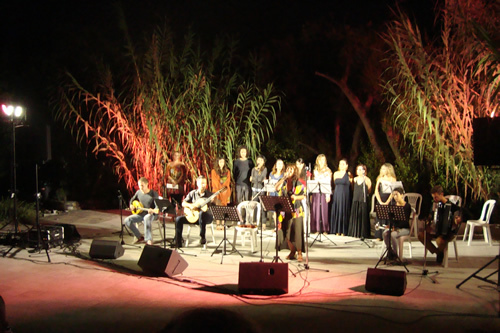 Like every summer since 1984, the George Angelinis - Pia Hadjinikou Cultural Foundation carries out a large number of cultural events and workshops in Horto. This year the programme is very extensive and various. At the end of September, the boat goes on the hard: a little earlier than we planned because of the unstable weather and also because we have some works to do. Checking the caulking of the teak deck - and renewing where necessary ( we use Sikaflex 290 DC compound - is a hard work that with the regularity of a clock requires a lot of care (and painful knees). Early too because we want to evaluate the new circumstances of the wintering as we have taken the decision for an other yard with boat parking: during the previous winterings we have been very stressed and more than irritated by the terrible mess, the absolute carelessness, the neglect of the terrain and the facilities, and the total lack of environmental awareness. The yard in Lechonia seems very neat, well organized and when asking information at our first visit about wintering conditions, the owner took immediately paper, pen and calculator: the total cost was accurately calculated and put on paper. This gave us the confidence that we had missed the previous years. 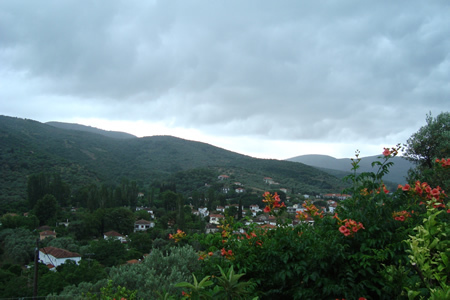 Additional advantage is that we don't have to cross Volos town as Lechonia is by fifteen kilometres closer to Horto. For rinsing and drying the sails we need a nice suitable day: not so obvious because the weather is not as steady and some days the humidity is too high to get dry the sails or ... there is too much wind! 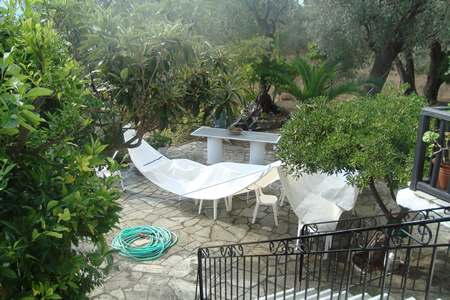 To be sure that everything is quite dry we let sails, tents, sprayhood and bimini spread in a room during a few days. Greece is like Italy and Spain, since years a transit country - but also a temporary (?) residence country for economic migration. Pakistanis and migrants from black Africa, but also from other poorer countries are part of the street scene. In tourist centres they are often visible for years: they try to sell their goods -mostly Chinese-made - to tourists. On return to Lefkas in 2009, we were in the small port of Corinth many times approached by Moroccans seeking for a better life, on the island of Aegina, every evening, during dinner in a tavern on the harbour, we were offered to buy - exactly every 3 minutes - CDs, lamps, dolls, umbrellas, DVDs, caps, and all kind of rarities. We bought a led lamp, that we keep with the other light giving tools that we bought in 2008 at Corfu or Lefkas, in similar circumstances, or sold by members of an association for deaf people. We were never sorry for it and these five or six lights we use almost daily on the often very poor lit paths or to show our presence on the sinuous road, returning home or to our boat after dinner in the village. Also in Volos, on the Promenade, these migrants-sellers are very active. 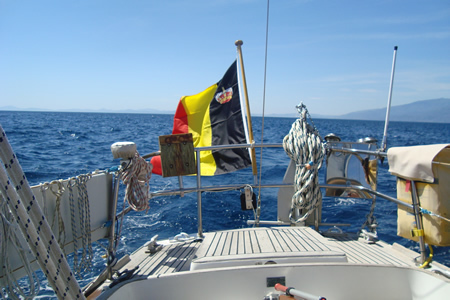 Already five years ago, on our winter return to Belgium, when approaching the ferry harbour of Igoumenitsa, we saw small tents of plastic sheets and cardboard in larger number. Three years ago we assisted in the harbour Patras to a dramatic cat and mouse game of young migrants with the port police. Around the large check-in zone of the new ferry harbour Patras South Port a quite impressive security fence is erected. Every time a young man succeeded to climb to the top of the fences and could maintain there just a few seconds, a police car patrolling on the embarkation area was rushing with blaring siren. This hassly game took hours and tourists were following with surprise and mixed feelings, at times heavily commenting this degrading spectacle. We never were eyewitness of the so many times very brutal actions of members of a. o. the far-right and racist political party, the Golden Dawn, but we have heard enough unacceptable statements and comments by their supporters. What we have read and seen in the media, however, was largely sufficient. 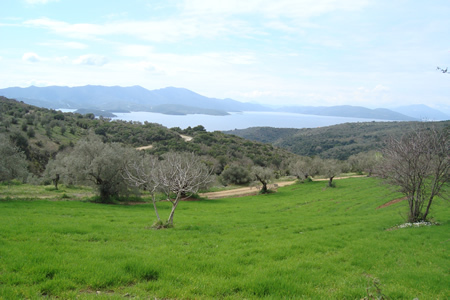 The tragic situation on the Greek-Turkish border around the of Evros-passage was well known. After destroying the regimes in Afghanistan, Iraq and Libya the number of political and war refugees increased sharply. From the story of French friends who sailed to Lebanon after the Summer back in Lefkas, we understood already that in a number of countries of the Middle East a tipping point had been reached, that, fed by the so-called Arab Spring from the end of 2010-2011, would generate a development that would generate a further destabilization in the region. The civil war in Syria and the emergence of the terrorist Caliphate Islamic State set going an ever-increasing flow war refugees which would attach to the existing political and economic migration. In the surrounding countries - Jordan, and Lebanon that is confronted too with heavy political instability - an absolute saturation point has been reached since many years in the refugee camps. The situation for refugees in Turkey is hardly better, even without prospect nor future, so that the pressure is increasing to find security and a better life in rich Western and Northern Europe for whom under the refugees belongs to the somewhat richer middle class. 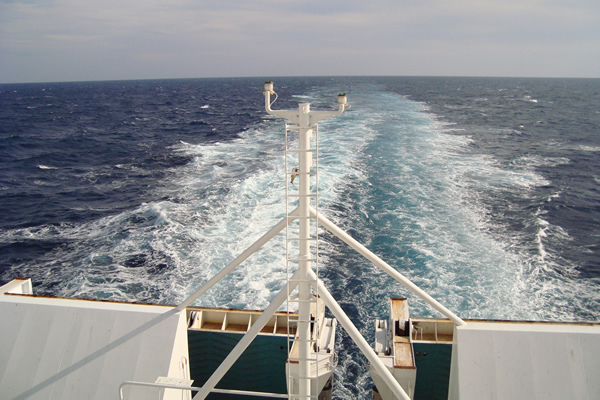 The crossing of the Aegean Sea to Greece where it is shortest - to the islands of Kos, Samos, Leros, and especially Lesbos ( six miles or 11 km ) - is thus the first stage when leaving Turkey to the land of hope, in the first place Germany, Sweden. From sailors who came along these islands we got their accounts: destroyed or torn rubber or plastic boats and life jackets on the so grey and orange coloured rocks and beaches. By dozens and dozens. Although we are quite far outside of the routes the refugees are following ( Northern Greece -> Balkan route, and, Eastern Sporades / Dodecanese -> Thessaloniki / Rafina / Athens - Piraeus -> Balkan route ) we want to affirm clearly our opinion, because the refugee and migration problem is not a temporary phenomenon. Once back in Belgium we will probably live here closer to refugees, because a reception centre is planned at 1 km from where we live. This is why we say "We're all Syrian or Afghan refugees ...". Like my grandmother refugee was on French roads to Bordeaux with her daughter, in the beginning of the German invasion in 1940, Eric says! It is an i. o. o. a natural process in which people try to escape war and violence, try to leave their country to live in freedom, try to escape injustice and persecution, but also to try to get better life, for themselves or for their children. And this is of all time. Naive who believes that borders, fences and repression are solutions. Maybe they give equally that illusion. Perhaps many will want or will have to return to their country, when peace is back, if the regime has changed. But maybe not, maybe never, because they have integrated here, because in the end we are happy with their arrival. And probably other will come, refugees or migrants, because the world is going like that, since the beginning of evolution. So we better organize it - because deny is only a waste of time - on a rational way. And that implies that we have to organise the urgency, but also act for peace where war and violence is raging, that we combat poverty and inequality, that we increase the pressure on world leaders for the protection of our planet ... If not, that future migration, for space, water and food will cause an even bigger wave of refugees, for our children and grandchildren! In the village almost all the tourists are gone, most of the small boats are already out of the water. From the five restaurants three have closed, two will remain open all winter. Most room lessors have taken away their panels. This year we saw in Horto generally less foreign tourism. 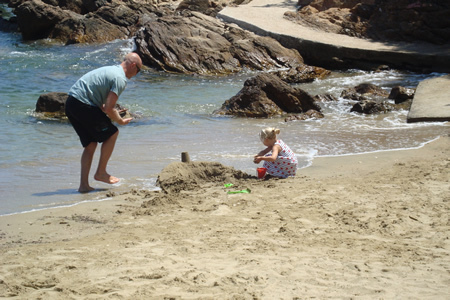 On the other side, beside English and Germans rather regular visitors, residents or owners of holiday houses, there were relatively - because the numbers remain small - more French, Bulgarians and Romanians. The limited number of flights on Volos New Anchialos Airport and especially the closure of a. o. of the Ryanair connection from Charleroi (B) is not without consequences. The future of this small airport would also be uncertain, as it is not included in the privatisation programme of (14) regional airports. Greek tourism seemed in August - thus after the eurozone agreement - maybe even some more numerous than the previous years. 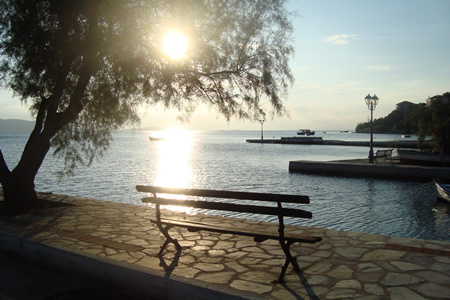 Some explain that many Greeks have chosen for holidays closer to home now island stays are more expensive in relation to disposable income ... assuming there is room for what is not absolutely necessary. 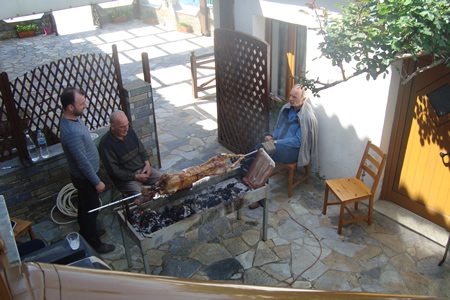 Horto is now ready for six months winter, a nice winter - καλο χιμονα, like people say when leaving each other now. ... till a close reunion in Spring ... well, so we hope !